It seems I'm on an Avengers kick this week. 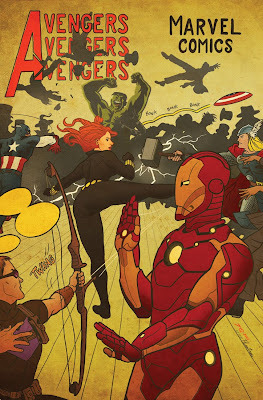 Today Marvel announced a series of variant covers they will be releasing this April under the banner "Avengers Art Appreciation". Throughout the month, "fans will have the opportunity to see their favorite super hero team in the styles of the world’s greatest artists like Rembrandt, Michelangelo, Monet, Pollock, Schielle and more!" I was asked to participate in the fun, with a tribute piece to Henri de Toulouse-Lautrec, for which I decided to reference his famous litho, Moulin Rouge: La Goulue. Hope you like! I would so buy a print of this. That is awesome. I can't wait to see the rest of them. A couple people have been asking, so I might just have to make them. Thanks Reau! Follow the link above to see the other covers in the series. Were you to make a print of this cover, I'd be absolutely thrilled! It's beautiful, and a lovely tribute to Toulouse-Lautrec.